The rapidly developing Al-Qaeda incursion is forcing the Iraqi government not only to buy more American weapons and supplies, but also to payroll an army of mercenaries and private contractors, previously hired by the US Defense Department. According to the Wall Street Journal, more than 5,000 specialists have been contracted by the Iraqi government. They are currently working in the country as analysts, military trainers, security guards, translators and even cooks. Some 2,000 of them are Americans. “The military task has, in fact, been outsourced in Iraq,” confirmed analyst Steven Schooner, a professor at George Washington University Law School. 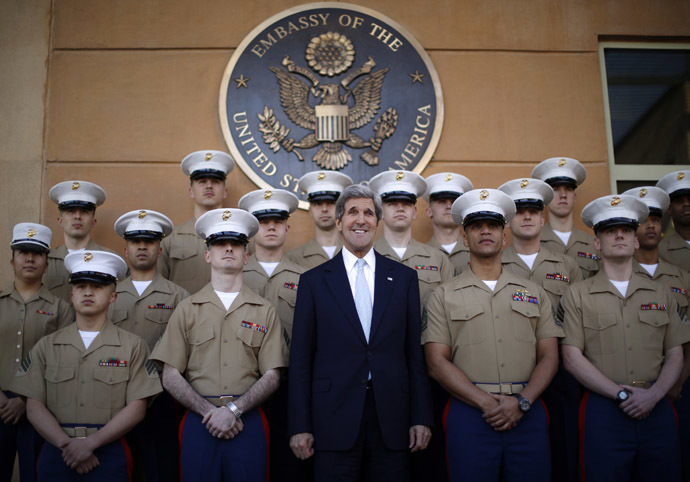 Washington’s relationship with Baghdad has undergone a major transformation. Officially, the US has just several hundred troops in Iraq and the US Defense Department does not contract private security companies to operate in Iraq. Yet the major shift in US-Iraq relations now is that Washington is no longer allocating budget money on operations in Iraq. It is Baghdad that spends money on American weaponry, vehicles and equipment, while American defense companies are earning money in Iraq by placing military contractors there. Private defense companies, such as Triple Canopy and Dyncorp International, have multibillion contracts in Iraq for years to come. Washington is actively assisting the Iraqi government in fighting terrorism, supplying Baghdad with drones and is considering training some of the country’s elite military forces in neighboring Jordan. An assault operation against the Islamic State of Iraq and the Levant (ISIS), a faction of Al-Qaeda currently occupying Fallujah, is promising to be a serious undertaking implying the use of the utmost in firepower, so Baghdad is buying $6 billion worth of military equipment from the US, including 24 Apache attack helicopters and nearly 500 Hellfire missiles. 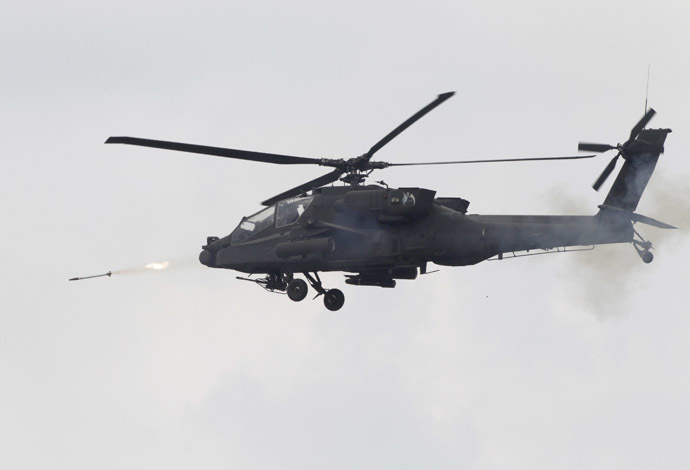 A group of top US lawmakers attempted to block the Apache deal, expressing concerns that providing Iraq with helicopters and other arms to help battle Al-Qaeda, would also mean that Iraqi Prime Minister Nouri al-Maliki might use them against his rivals. But the deal has nevertheless been finalized and the first batch of helicopters is expected in Iraq soon, along with the Hellfire missiles. This also means that 200 more contractors will come to Iraq to ensure the helicopters operate properly. In the meantime violence in Iraq is at a record high. Al-Qaeda militants are advancing in the country’s south and are staging regular terror acts. It seems the Iraqi government has little choice but to come down on the insurgency with deadly force. It is probably no exaggeration to say that the war in Iraq is as far from being over as it was in 2003, with two major differences though. First: in the absence of Saddam Hussein his troops have been replaced with Al-Qaeda mujahedeen. Second: the US regular army has been supplanted by thousands of contractors, the Wall Street Journal reports. The rest remains the same: English-speaking mercenaries are expected to choreograph the storming of Iraqi cities defended by Arab-speaking fighters of Al-Qaeda, exactly as it was back in 2004 during the Battle of Fallujah. Today Fallujah, occupied by Al-Qaeda, remains the primary target for the Iraqi government forces to assault backed by mercenaries. US troops entered Iraq in 2003 and officially withdrew from the country in 2011. At the peak of war there were 157,800 American military personnel in Iraq. Pentagon spokesman, Navy Commander Bill Speaks, reported that there are only 250 American troops in Iraq. These servicemen are either advisers assigned to the Office of Security Cooperation overseeing the US military interaction with Iraqi national forces, or Marine Corps security guards securing US diplomatic facilities. After the withdrawal of the US troops from Iraq, the duty of protecting US interests in the country was relegated to thousands of contractors from the US Defense Ministry and other security agencies. According to the US State Department and Pentagon, it is estimated there were over 12,500 contractors in Iraq, working for the US government as of January 2013. By October, according to a quarterly report, their number had decreased to 6,624 specialists. Less than a quarter of them (1,626) were American citizens, the rest were Iraqis (2,191), with 2,807 civilian experts from foreign countries. Bill Speaks said that the last major US Defense Department contract in Iraq ended on December 15 and now there are zero contractors in Iraq hired by the US Defense Department. Where did all those contractors go? They are still in Iraq, maintains the Foreign Policy magazine. The FP asked Triple Canopy, a huge private defense company and sanctuary for the US Special Forces veterans, for details and learnt that “Recently all US government agencies have reduced their reliance on contractors due to budget cuts and have de-scoped contracts across the board, including in Iraq,” the company said a statement. “Contractors will continue to remain engaged in Iraq in the near future. However, the majority of these personnel will likely be working on commercial extractive and construction projects,” the company said. Contractors from America’s biggest defense companies are providing maintenance for the equipment and vehicles previously bought by the Iraqi government from the US, such as helicopters, C-130 transport aircrafts, surveillance planes, drones, communication equipment and more. Over the years of the wars in Iraq and Afghanistan there have been multiple cases of contracting fraud. The US Congress’ Independent Commission on Wartime Contracting determined that at least $31 billion in US funding had been wasted due to “poor oversight, fraud, waste, and abuse,” said FP’s former US Representative, Christopher Shays, who used co-chair the Commission. The US has allegedly spent over $200 billion on contractors in both Afghanistan and Iraq over the last decade. Now that the US administration has transferred these expenditures to the Iraqi government, the American military industrial complex and private security companies are ready to make a fortune in Iraq.